The Swedish Torch could be the answer to all your campsite problems. Summer is finally here, and that means that it is time to set up the barbecues and descend on campsites for some wholesome outside fun. Unfortunately, all of this outside fire burning requires a lot of hard work including chopping wood, lugging it around and positioning it which can often turn out to be the bane of summer life. However, a very clever hack called the Swedish torch might be the very solution to cut out all of these annoying problems. The first thing that the Swedish torch requires is a very specific kind of log that is quite wide and flat on both the top and the bottom. After that, find a saw or a similar large cutting tool to make two or three cross-hair cuts across the top of the log. These incisions need to go around three-quarters of the way down the log. Then it’s time to start the fire on the top of the log using kindling. 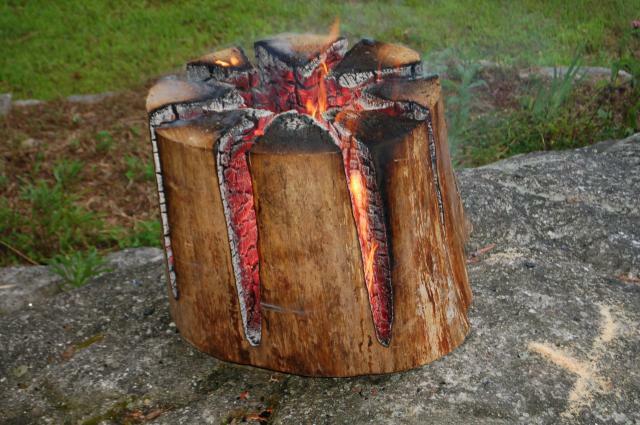 The airflow created by the incisions in the log will ensure that the fire is well oxygenated and that it will stay alight. As the fire picks up the pace, the embers will cascade down to the bottom of the log which will ignite the entire piece of wood resulting in a long-lasting, fire. It is very important to make sure that the log is completely flat on the top if the fire is supposed to be used for cooking so that a kettle, pot, or even a cast iron skillet can be placed on top of the log for an authentic fire-cooked meal. No one is quite sure where the idea for the Swedish torch came from, but it has been suggested that the ingenious idea was struck upon by a train hopper traveling across Europe who came up with the trick to keep warm while waiting for connecting train rides.